Major military and covert intelligence operations are being undertaken simultaneously in the Middle East, Eastern Europe, sub-Saharan Africa, Central Asia and the Far East. The US-NATO military agenda combines both major theater operations as well as covert actions geared towards destabilizing sovereign states. America’s hegemonic project is to destabilize and destroy countries through acts of war, covert operations in support of terrorist organizations, regime change and economic warfare. The latter includes the imposition of deadly macro-economic reforms on indebted countries as well the manipulation of financial markets, the engineered collapse of national currencies, the privatization of State property, the imposition of economic sanctions, the triggering of inflation and black markets. In turn, the demise of national sovereignty was also facilitated by the instatement of the World Trade Organization (WTO) in 1995, evolving towards the global trading agreements (TTIP and TPP) which (if adopted) would essentially transfer state policy entirely into the hands of corporations. In recent years, neoliberalism has extend its grip from the so-called developing countries to the developed countries of both Eastern and Western Europe. Bankruptcy programs have been set in motion. Island, Portugal, Greece, Ireland, etc, have been the target of sweeping austerity measures coupled with the privatization of key sectors of the national economy. The global economic crisis is intimately related to America’s hegemonic agenda. In the US and the EU, a spiralling defense budget backlashes on the civilian sectors of economic activity. “War is Good for Business”: the powerful financial groups which routinely manipulate stock markets, currency and commodity markets, are also promoting the continuation and escalation of the Middle East war. A worldwide process of impoverishment is an integral part of the New World Order agenda. The monetary dimensions are crucial. The international financial system established under Bretton Woods prevails. The global financial apparatus is dollarized. The powers of money creation are used as a mechanism to appropriate real economy assets. Speculative financial trade has become an instrument of enrichment at the expense of the real economy. Excess corporate profits and multibillion dollar speculative earnings (deposited in tax free corporate charities) are also recycled towards the corporate control of politicians, civil society organizations, not to mention scientists and intellectuals. It’s called corruption, co-optation, fraud. 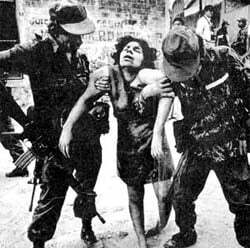 In Latin America, the military dictatorships of the 1960s and 1970s have in large part been replaced by US proxy regimes, i.e. a democratic dictatorship has been installed which ensures continuity. At the same time the ruling elites in Latin America have remolded. They have become increasingly integrated into the logic of global capitalism, requiring an acceptance of the US hegemonic project. Macro-economic reform has been conducive to the impoverishment of the entire Latin American region. Any attempt to introduce reforms which departs from the neoliberal consensus is the object of “dirty tricks” including acts of infiltration, smear campaigns, political assassinations, interference in national elections and covert operations to foment social divisions. This process inevitably requires corruption and cooptation at the highest levels of government as well as within the corporate and financial establishment. In some countries of the region it hinges on the criminalization of the state, the legitimacy of money laundering and the protection of the drug trade.